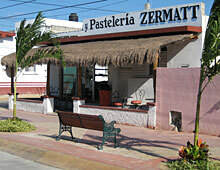 There are lots of restaurants in Cozumel. 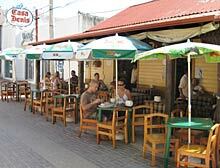 Cozumel restaurants range from fancy upscale places like Pepe's, to sidewalk churro vendors. Is the food safe to eat? Most of the dining is geared toward the tourist market, so the restaurants serve bottled water and the ice is also made of purified water. Use your own good judgement - if the place serves a lot of tourists they probably have US-style hygiene. 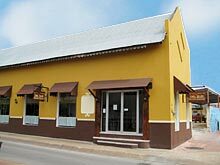 As for the smaller Cozumel restaurants that cater mainly to the locals, well, the locals don't want to get "la tourista" any more than you do. The majority of them also serve purified water and ice. Take a chance; part of travel is trying new things. There is also shopping, exploring, and nightlife to keep you occupied. 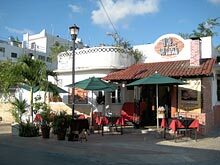 The following is a BRIEF listing of some restaurants to try while on Cozumel. These are in no particular order. A steak house serving Angus beef and fresh seafood cooked over an open fire charcoal grill. The best burger in town. Fantastic Margaritas. Extensive wine selection. About a one minute walk from our houses. At the corner of Calle 6 and Avenida 5. Benito's Brick Oven Pizza and Pasta is a homey, Italian trattoria. The pizzas are handmade and baked in a wood-fired brick oven. The pastas are made from old family recipes. Bring your date, your family, or your dive buddies and enjoy the best pizza and pasta dishes this side of the Caribbean! 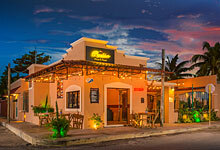 Check out the Benitos Cozumel web site. At the corner of Calle 15 Sur and Avenida 50 Sur. This is a very romantic restaurant specializing in Mexican cuisine. The menu is not huge but the food is great. Enter through Cinco Soles. They have a VERY large selection of tequilas you can sample. 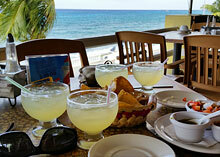 The Margaritas here are great - lime juice, controy, tequila - the classic recipe. No mixes and they don't skimp on the tequila. Located behind Cinco Soles store on the waterfront at Calle 8. Enter through Cinco Soles. Brick oven pizza - excellent! Also, every day there are a couple of "specials" that are always fantastic. From the sidewalk you can only see the indoor dining area and it looks deserted. Be sure to walk all the way back to the courtyard - that's where everyone eats. 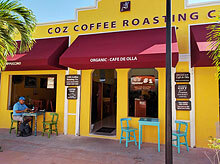 Located on the waterfront between Calle 6 and Calle 8. One of the best restaurants on the island. Only a short taxi ride from the house. 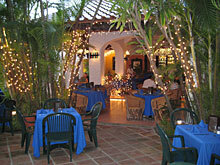 Originally a large old house, this restaurant is set back from the street in a spacious garden. After you're seated, a guy rolls up a cart and prepares your guacamole and pico do gallo table-side. The food is fantastic. On 55 Ave. between Avenida Benito Juarez and Calle 1 South. A contemporary Mexican dining experience in an outdoor tropical garden setting. The open air dining area provides a beautiful ambiance for the guests. 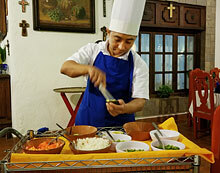 Modern Mexican cuisine, hand made cocktails and fresh ingredients make for some very tasty meals. Located on 5th Ave., between Calle 5 and 7 Sur. It's beyond the other side of the plaza from our houses. It's walkable and worth it. La Choza features Mexican and Yucatan specialties. Fish, enchilladas with mole sauce, and of course fajitas. You know it's good when the locals choose this place for the special dinner out on Sunday. The Margaritas taste fine but they are weak. 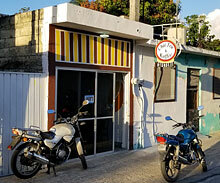 Located near the corner of Calle A Rodolfo Salas and Avenida 10. La Cocay serves some continental, some mexican, some Mediteranean, and some Italian food. Easily worth a couple of visits. Save room for the Cocay chocolate torte with vanilla ice cream for dessert - it's best to order it at the beginning so they can get started making it. Very close to our houses. 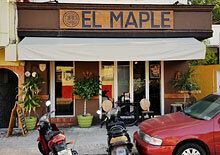 Located on Calle 8, between Avenidas 10 and 15. Great food, service, and atmosphere. Mexican food, seafood, and continental food all served with a special twist. Pass through the indoor seating to the garden in the back. Located about 5 minutes from our houses on Avenida 5 between Calles 2 and 4. Fabulous coffee where the beans are roasted on premises. Also serves breakfast and lunch. You can take a tour of the roasting room and sit back and watch the people go by. You can bring their freshly roasted, freshly ground coffee back to the house and enjoy it while you're here. On 5th Ave. in the central downtown area near the plaza. A very small coffee shop almost across the street from our houses. Coffee, tea, smoothies, crepes, and more. Very convenient. On Calle 6 between 5th and 10th Ave. This restaurant has been serving Mexican home cooking since 1945 - before Cozumel was a tourist attraction. All the usual entrees, plus pollo pibil (chicken and spices baked in a bannana leaf) and pollo con mole (chicken with a sauce who's main ingredient is a spicy chocolate sauce ñ sounds crazy but it's great). Good margaritas and mojitos. Located just off the main plaza on Calle 1 Sur. So close you can see it from both our our houses. Breakfast, lunch and dinner featuring basic Mexican home cooking. A great place for breakfast. One of the best restaurants in town, and definitely one of the hardest to find. 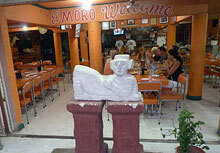 El Moro has been in business for over 40 years and specializes in local food with a Yucatan influence. Seafood, chicken, pork, beef and more offered in a variety of ways from a huge menu. VERY reasonable prices and very casual. Dress cool - there isn't much cross ventilation. 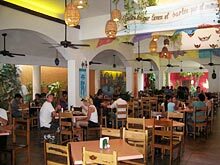 This restaurant is very popular with divers and people who have been to Cozumel many times. It usually takes a few visits to the island before you find it. El Moro is closed on Thursdays. Note: there is only one El Moro. It is not "Los Moros" or "El Morrito." Located on 75th Norte Bis, between Calle 2 and Calle 4 Norte. In other words, it is WAY back in town, away from the waterfront area. When you start to feel like there is NO WAY a decent restaurant could be in THIS neighborhood, then you're getting close. The taxi drivers all know where it is, just be sure you're going to the right restaurant. One of the nearest bakeries to our houses, and one of the best in town. Fresh baked bread, cookies, pastries, croissants, and more. Stop here in the evening on your way back to the house for tomorrow's breakfast fixin's. Located at the corner of 5th Ave. and Calle 4. A very nice bakery that also serves breakfast, lunch, and great coffee. Gets great reviews. On Calle 6 just down the street from our houses. Right on the waterfront in the center of town, this is a great spot to sit and watch the people - the people, as in the tourists milling around the area fresh off the cruise ships or the ferry from the mainland. If you wait long enough everyone in town will walk by. Palmeras serves HUGE margaritas and a decent variety of other food. Breakfast, lunch, and dinner - all very good. Located on the waterfront in the main plaza of town. An Argentinian restaurant specializing in empanadas - pastry stuffed with meat, vegetables, and spices. Also steaks and various other beef cuts. Great wine selection, all from Argentina. Air conditioned. Located at the corner of 5th Ave. Sur and Calle 5 Sur. Yes, it's a museum, and a pretty interesting one, too. 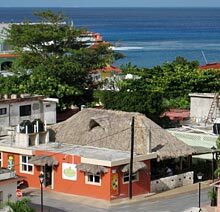 But they also have a rooftop cafe that serves a great breakfast and lunch overlooking the Caribbean. Seriously. Perfect for your first morning on the island before you've had a chance to do any food shopping. Some of the best margaritas in town. About a 2 minute walk from our houses. At the corner of Calle 6 and the oceanfront.